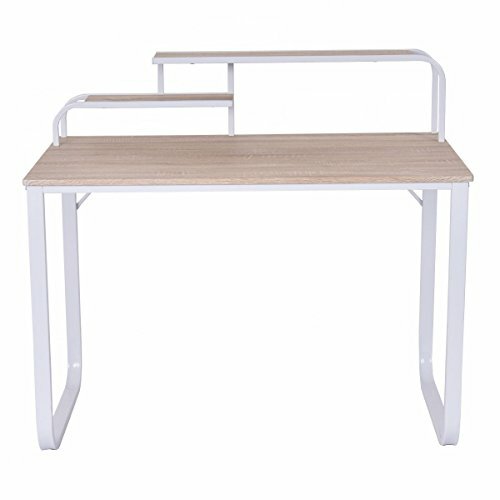 With the sleek and sturdy powder-coated metal frame, this wooden workstation not only provides years of sturdy and reliable use but also a perfect decor for adding a sense of simplicity to your home. Utility and compact, the full size desktop provides a capacious workstation space for you to dedicate yourself to what you've focused on. And two tiers of extra shelves is well designed for putting your daily supplies and files in order, making you have the access to the comfort and simplicity no matter when you're at work or just relax. This wooden workstation is sure an eye-catcher for your home and office, take it to write your own stories today!